Browse: Home /	Composting, ZERO WASTE / Keep leaf composting alive in Brooklyn! 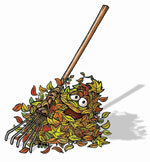 Keep leaf composting alive in Brooklyn! This Saturday, October 3rd, join with the Brooklyn Botanic Garden and local gardeners to take the initiative on establishing a community-led leaf composting project! Due to budget cuts, in 2008 New York City discontinued both its autumn leaf-collecting project and free compost pickups in the springtime. This was a big step backwards for the city, from the standpoint of both urban gardening and Zero Waste advocates: huge quantities of leaves (potentially soil amendments) are once again being sent to landfills. The good news is that a group of Brooklyn compost advocates are meeting this Saturday to come up with a community-led initiative for collecting leaves to create compost and mulch for urban gardens! Read on for more info (the message quoted below has been making the rounds in community gardening circles). Please join your fellow community gardeners and our friends from the Brooklyn Botanic Garden for a brainstorming session that will focus on how we can expand and improve community leaf collection and recycling this fall. As you know, the City will not be collecting leaves separately from regular trash, again, this fall. That means that it’s up to us to find ways to take this rich source of garden nutrients out of the waste stream and bring it into our gardens, where it will do the most good. Building on a very successful leaf collection and recycling project that was implemented at 6/15 Green garden last year, we hope to coordinate a Brooklyn-wide project that will enable local community gardens to be collection points for bagged leaves from their neighbors for use in the community gardens….and possibly even distributed back to the community in the future. This is truly a win/win for everyone. Gardens will benefit from the addition of wonderful leaves that they can use as mulch or make into “brown gold” compost and residents will be able to recycle their leaves knowing that they will not be wasted clogging up our landfills. Please join us for our first planning meeting to get the ball rolling. We’ll be brainstorming on the basic strategies of how we can work together, coordinate dates and collection methods, create a unified press release and outreach and the ways we can avoid duplication and confusion of efforts. We really need your voice and your ideas right from the start! Feel free to forward this information to any community gardens or other folks you think would like to be part of this project. Subways: M. R to Union St Buses: B63 along Fifth Ave B37 & B103 along Third Avenue B71 along Union St. Thanks for posting this, Anne! Thank YOU for telling me about it!